Is it weird to post ice cream in January when more than half of the country is experiencing severe cold weather and winter storms? Here I am complaining that I want some winter weather in California and you guys can’t even step outside. Lots of my food blogging friends who are home baking are saying that their ovens are helping keep their houses warm- now that’s cold! Growing up in Vermont (and born in the UP of Michigan), I have experienced my fair share of cold weather. I recall one morning when we went into the office and the -20 degrees. Those are the days I don’t miss- at all. I hope you all stay warm and safe! So you might think that there really isn’t a place for ice cream in January, but I am thinking that maybe some of you got an ice cream maker for Christmas that you are just dying to try out. I certainly did! I actually got my LAST Christmas and have barly used it, until now. For some reason, I was intimated of homemade ice cream, I really don’t know why. It couldn’t be easier. I made several ice cream recipes over my holiday break, and had so much fun with the flavor combinations. And let’s face it, I certainly didn’t mind eating it either.I also got a new ice cream freezer container from William Sonoma that I love! 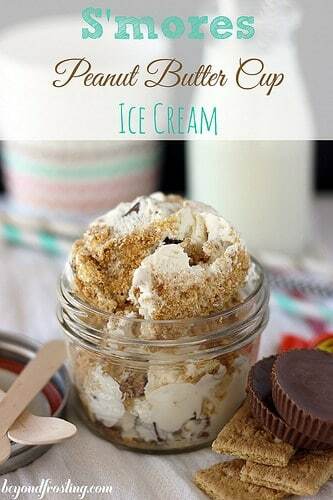 Homemade ice cream puts most store bought ice cream to shame in my opinion. It is SO much creamier, and you can make any flavor combination you want! This was my first time making a successful homemade ice cream and now I am totally hooked. 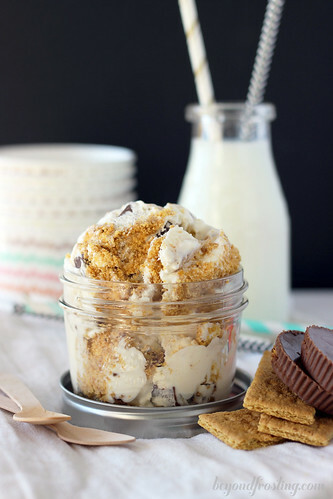 The first recipe I made was this S’mores Peanut Butter Cup Ice Cream. I started with a basic vanilla ice cream slightly adapted from Simply Scratch. After churning for several minutes, I added some marshmallow fluff and crushed Reese’s Peanut Butter cups. Once completed, I layered in crushed graham crackers. I have to say, after I finished the first bowl, I was ready for the next. Pre-freeze your ice cream maker attachment as directed, usually at least 15 hours. Heat 1 C whipping cream with ¾ C sugar and a pinch of salt. Heat in a pot on medium heat, stirring just until it starts to bubble and sugar is dissolved. Let cool for a few minutes and add remaining 2 cups of heavy whipping cream and vanilla extract. Refrigerate until completely cooled. Once frozen, set up ice cream maker, and spin on low speed, pour heavy cream mixture into ice cream maker after it starts spinning. Stir on low speed for 10 minutes and increase to medium speed. After 5 more minutes, add marshmallow fluff while machine is still spinning. 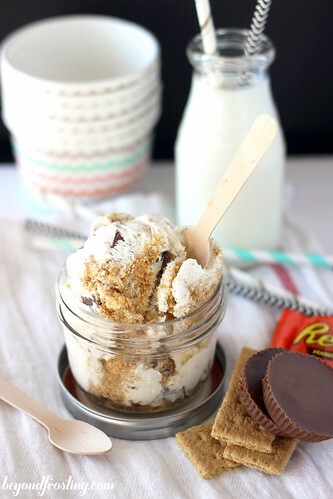 Chop up 6 Reese’s peanut butter cups into small pieces, and add all but a few pieces into the ice cream during the last two minutes of mixing. Reserve a few pieces of Reese’s. 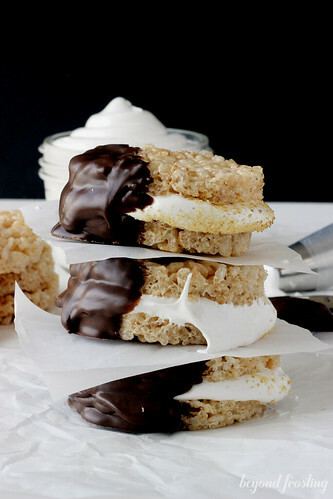 While ice cream is spinning, chop up graham crackers in a food processor to a fine crumb. Melt butter in a microwave safe bowl. Add melted butter to graham cracker crumbs and stir to combine thoroughly. Once ice cream is done mixing, pour 1/3 of ice cream in your container, followed by a 1/2 of graham cracker mixture. Repeat with the second 1/3 of your ce cream, and top with remaining graham crackers. Pour the last 1/3 of ice cream on top. 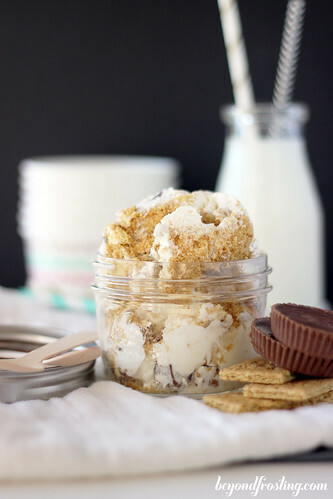 So you have 3 layers of ice cream and 2 layers of graham cracker. 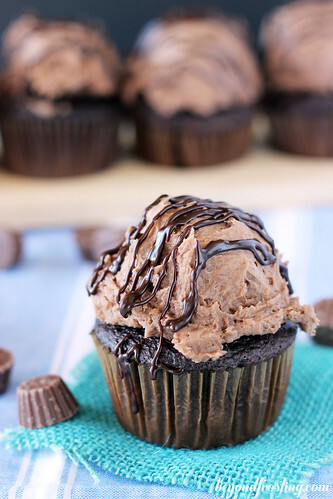 Press leftover Reese’s into the top of the ice cream. Return to freeze for 2-3 hours until desired consistency. 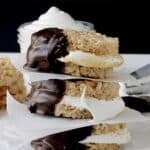 I am doing an ice cream roundup on my blog this week and I was wondering if I could use one of your pictures with a link back to your site of course. I love this recipe and flavor combination! Thanks for asking Hannah. You can include me as long as you don’t post my recipe 🙂 Thank you! Thanks! I won’t post your recipe, just the link to it here.